Tiny Cat Vodka, distilled by Fainting Goat Spirits in Greensboro, N.C., is made from organic red winter wheat that is grown in North Carolina. What vodka is in your liquor cabinet? My bet is, for most of you, it starts with a “T” and ends with “OS.” This famous vodka may have started as a small craft, but it’s now one of the largest vodka brands in the country. Here at home, the significant growth in craft vodkas is also exciting. Today, there are 18 vodkas produced by North Carolina distilleries. 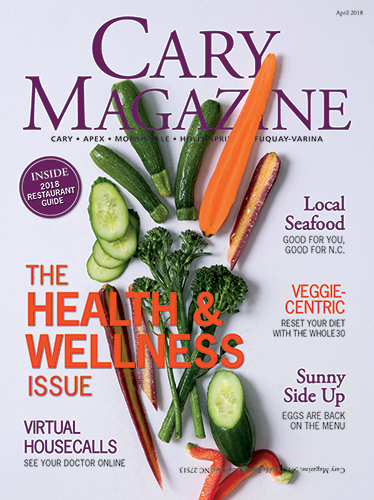 In 2017 alone, the Triangle saw the launch of four new vodkas: Durham-based Graybeard Distillery’s Bedlam, Kinston-distilled Three Stacks Distilling Company’s Social House, Fuquay-Varina-based Gold Leaf Distillery’s Spell Maker and Durham Distillery’s Cold Distilled Cucumber Vodka. They join existing Triangle vodkas from TOPO and Fair Game Beverage. This category is growing because vodka inherently reflects its distillery and its distillery’s ethos. Specifically, grain-to-glass vodkas are identified by the type of grain and often the terroir of where the grain is grown, how it’s distilled and the water it contains. Shake all ingredients vigorously with ice for about a minute. Strain into chilled coupe glass. Cheers! The vodka we’re featuring this month is Tiny Cat Vodka, distilled by Fainting Goat Spirits. 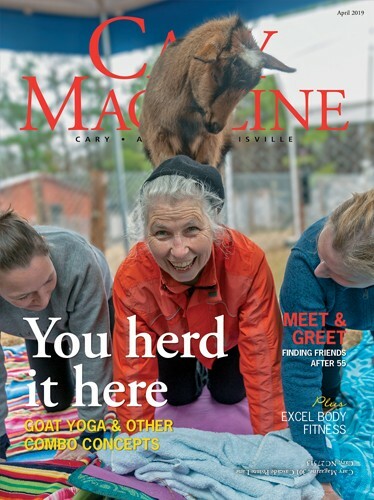 Owned and operated by the Norman family, Fainting Goat Spirits is a fantastic distillery to visit. Located in downtown Greensboro, it has a wonderful tour that walks you through how the spirits are made. 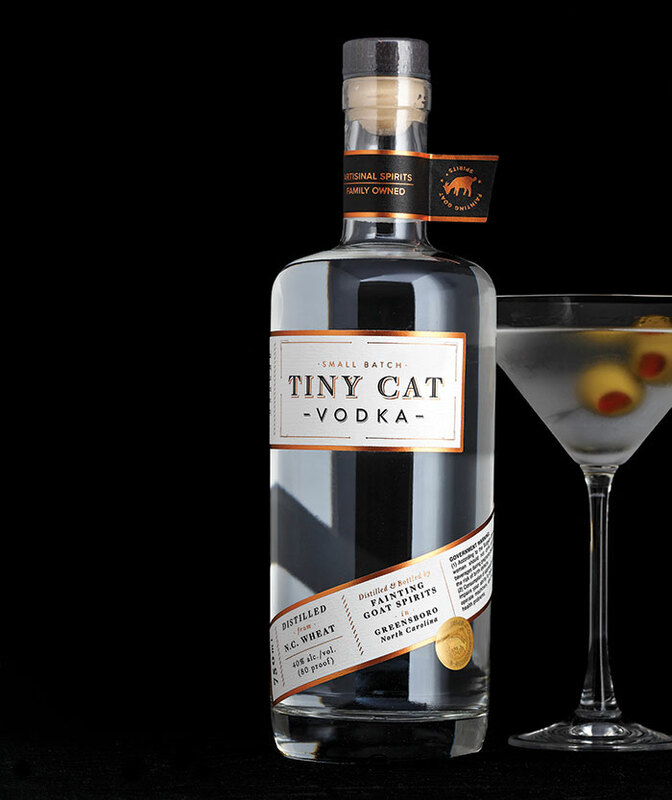 Tiny Cat Vodka is a grain-to-glass vodka made from organic red winter wheat that is grown in North Carolina. Tiny Cat won several prestigious awards in 2017 including a Gold Medal at Denver International Spirits Competition, Silver at the New York International Spirits Competition and Bronze at the American Distilling Institute Spirit Competition. On the nose, the sweetness of the wheat comes through immediately. For me, the aromas of wheat vodka and wheat whiskey are almost indistinguishable — the difference is in the taste. The goal for vodka is to get that soft, creamy and yes, neutral taste. Tiny Cat achieves this beautifully and with a bit of malt, too. While not as neutral as corn-based vodka, the wheat definitely adds to its personality. Where does that matter? Cocktails of course! Tiny Cat in a cocktail is best where the subtle sweetness of the wheat complements the cocktail’s balance. It’s the perfect choice for a chocolate martini.